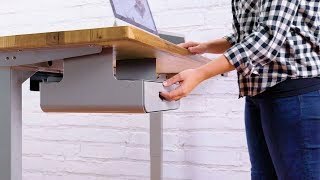 A padded shelf on top houses laptops and devices up to 13" by 13"
How easy is it to install the Locking Under Desk Drawer? Very easy! This under-desk drawer is installed via six wood screws. Just line up the drawer so that it's flush with the front edge of your desk, and use a drill with a ⅛" drill bit to drill the screws securely into place. How does the drawer work? After installing the locking drawer under your desktop, this drawer is ready to use! The shelf is great for holding laptops and tablets up to 13 inches square, while the drawer holds things up to 12 inches square. A single key locks the unit for an extra layer of security at your workstation. Will this drawer fit under my desk if I already have a keyboard tray? In most cases, yes. This depends on a few factors, including the size of your desktop and the amount of accessories already installed, and their placement. If you have any questions, don't hesitate to call our sales professionals and we'll be glad to help you figure out which desk storage option is right for you. How much will fit in the drawer? The locking drawer can hold personal items, papers, and documents up to 12 inches by 12 inches. The upper shelf comes with an extra inch of space, so you can place your laptop, notebook, or tablets on top, up to 13 inches square. You bet! The Locking Under Desk Drawer comes with three powder-coated color options - white, black, and gray. Our under-desk drawers are designed to complement UPLIFT Desk accessories, so you can match your desk until your heart is content. Lock up your valuables with the black, gray, or white powder-coated Locking Under Desk Drawer.